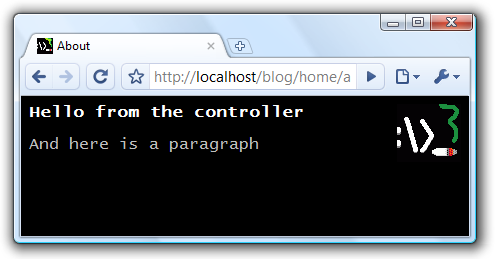 It's time to meet the MVC web framework to end all MVC Web frameworks. 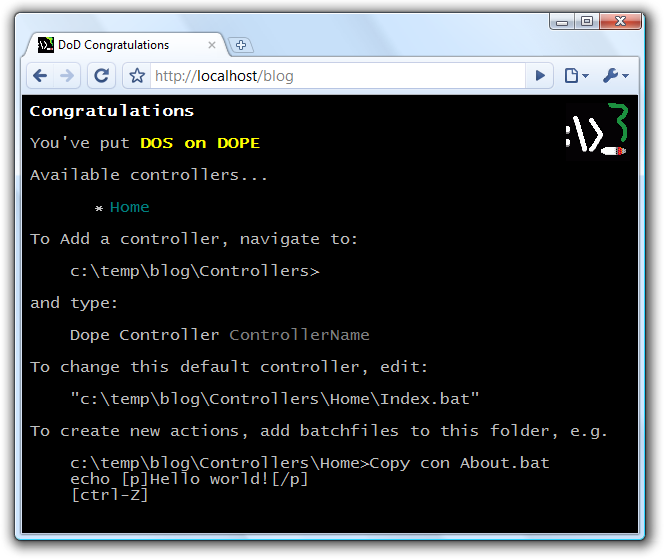 DOS on DOPE is the modern MVC framework built on the awesome power of Batch scripts. All of the controllers in DoD are batch files. All of the views are batch files. The model is based on batch files. The helper functions are... you guessed it! Beautiful batch files! Oops. It moves too fast, I can't keep up. Let's create a new controller action, and see how it looks. ...hit refresh and see what changed. 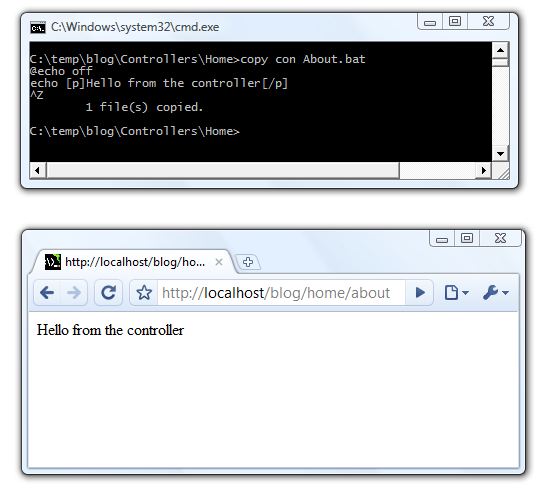 Notice the use of html helper methods like 'p.bat' and use of the partial, '_header.bat' to give styling and a title to the page. But websites don't live in a vacuum. We need some data to bring this thing to life. In DoD we embrace the NoSQL movement and jump straight to the data-store of the future: a CSV file. Posts.csv is both the model that describes our data, and the store which will contain the data itself. 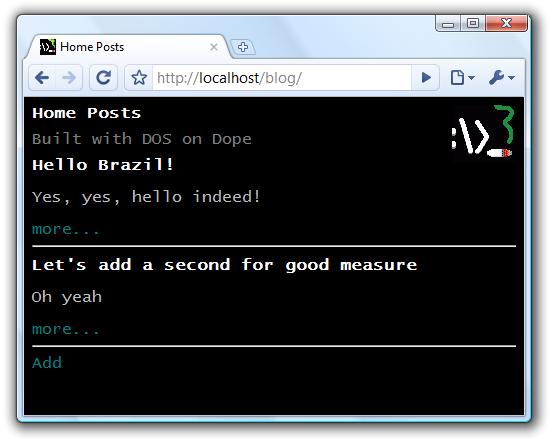 The generator has created a nice page for us, with a name and textbox for every field, so we can create new posts. 1`Hello Brazil!`Yes, yes, hello indeed! If you can't trust public visitors from the internet, who can you trust? Executing user input as commands inside the operating system is the most direct way to get things done, and that's what matters most. So far I haven't run into any performance problems. Whenever I've opened up a DoD website to several users, my hard drive tends to get wiped long before I discover performance issues. 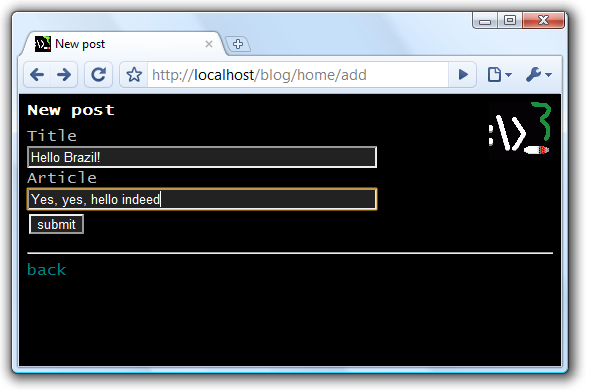 A full-featured web development framework with the smallest possible concept count.